Miss Sarah G. Andrews responds to Miss Berry's appeal with a $15 donation. 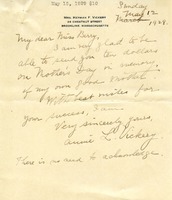 This is a letter to Martha Berry in which Mrs. Annie L. Vickery donated $10.00 to the Berry Schools in memory of her mother on mother's day. 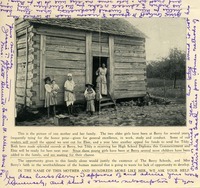 The printing company sends Miss Bessie Bonner a proof of a Mother's Day folder for her to look over before completing the order. Mrs. Rowe donates $150 to the Berry Schools in response to Martha Berry's letter asking for donations for scholarships. Request for a donation of $150.oo for a scholarship for a boy or girl. 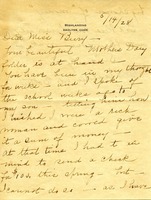 Letter asks the friend to fund a scholarship in the name of their mother. Recipient funded a $2500 scholarship in honor of her mother. An advertisement with photograph and story of two outstanding Berry girls. This article encourages readers to sponsor a student's schooling for a year for $150. 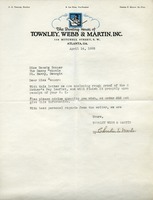 Mr. Martin of Townley, Webb & Martin, Inc. sends a rough proof of a Mother's Day leaflet for her approval. Mr. Martin also inquires about the quantitiy of leaflets that should be made. This letter contains information about the most recent edition of the Highlander at Berry College. 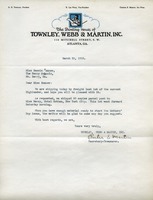 The author informs Berry Schools that the remainder of the shipments are being made. Mr. Martin ends by asking for the materials for the Mothers' Day issue of the Highlander. 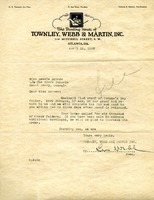 Letter to Martha Berry from C.N. 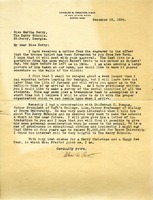 Letter from C. N. to Miss Berry regarding a meeting with Mr. Penney in Florida and other fundraising efforts in New York City. 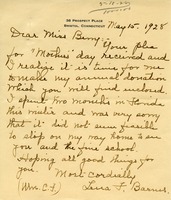 A letter to Martha Berry from C. F. Barnes describing the donation that Barnes is supposed to be giving to the schools. She explains that she has been away and has not been able to come visit the schools. 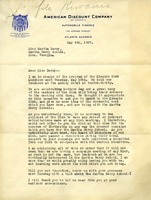 This is a letter from the Atlanta Kiwanis Club requesting Martha Berry do a presentation about The Berry Schools to members at their Mother's Day luncheon. Proctor advises that the plaque for the dental clinic has been shipped from New York and hopes that the engraving, which includes a line from a poem written by his son two days before he died, meets with Berry's approval. He describes his planned visit to survey the dental condition of the students, which he believes can be done efficiently. Proctor recently spoke with Dr. Herman C. Bumpus, former president of Tufts College, who wishes to make a visit to Berry soon.